All images are the work of Steve Yerby. Steve, originally from southeast Texas, has been interested in both astronomy and photography from a young age. He began learning about the night sky in earnest as an adolescent, having received a telescope as a gift. Photography started to play a big role in Steve’s life during early adulthood, when he captured many images of his world travels on film. Steve moved to Vermont in 2000, and settled in Richmond in 2005. 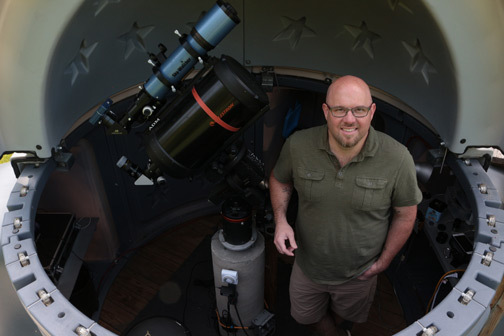 Combining his interests, he started in astrophotography about 8 years ago, and built Rocky Road Observatory in 2009, to further facilitate the capture of the beautiful images you see today. He is inspired by the work of Carl Sagan and Neil DeGrasse Tyson.